Choir Boy Combing Hair for Easter, a Norman Rockwell painting, appeared on the cover of The Saturday Evening Post published April 17, 1954. This is another timeless favorite of Rockwell collectors, a classic for all the ages. This painting was Rockwell's 282nd overall out of 322 total paintings that were published on the cover of the Saturday Evening Post. Rockwell's career with the Post spanned 47 years, from his first cover illustration, Boy With Baby Carriage in 1916 to his last, Portrait of John F. Kennedy, in 1963. This was also the fourth cover for The Post in 1954. In 1954, there were six Norman Rockwell Saturday Evening Post covers published. The original oil on canvas painting, 29 x 26.5 inches or 73.5 x 67.5 cm, is part of a private collection. on page 198 of Norman Rockwell, A Definitive Catalogue by Laurie Norton Moffatt. Several studies also appear in the Norman Rockwell Catalogue on page 198 and 199. Pristine original copies of this magazine cover sell for respectable sums on eBay, when it is offered. And to think it only cost fifteen cents originally! And it was mint condition then, too. 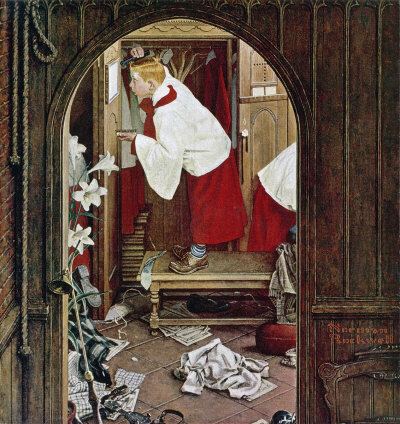 In this painting, Norman Rockwell takes us behind the scenes on Easter morning at church. Luckily, the church goers do not get to see this helter-skelter mess of a choir room. We can observe all manner of clothing articles from pants to shirts to shoes, all strewn wherever they might land. I guess the choir boys are in too big of a hurry to get ready to converned about hanging up their clothes as they change. I still see a few cossocks and surplices hanging in the closet. Do they keep extras, or are some boys even later than the two we see here? One funny detail that i noticed is the lone roller skate at the bottom of the picture. Another nice Easter touch is the inclusion of the Easter lilies just inside the door on the left hand side. Choir Boy Combing Hair for Easter was only one of 322 Norman Rockwell Saturday Evening Post covers; Here is the list of Norman Rockwell Saturday Evening Post cover illustrations. The model for the boy combing his hair eas Peter Rockwell, the artist's youngest son. This was not his first, nor his last time modeling for his talented father. The mirror is so high that he must stand on a table to see himself well enough to comb. He must tae solace in the knowledge that one day his voice will change and he will be promoted to altar boy. Do You Have A Great Story, Opinion Or Contribution About Choir Boy Combing Hair for Easter?